The Health Care Initiative impacts managerial practice and the pace of innovation by educating leaders and innovators who aspire to improve value across the health care industry. The Initiative fosters and promotes faculty research, supports the development of a portfolio of high-impact educational programs, and creates an interconnected HBS health care community. MBA Students by promoting the delivery of an MBA program that allows students to focus on health care through industry-related courses, extracurricular activities, and recruiting opportunities. Faculty by facilitating collaboration among faculty members to promote the generation of new knowledge and concepts in health care management and innovation, and to disseminate these works. Alumni by offering opportunities to participate in health care activities at HBS, and through the ongoing development of the alumni health care network. Executive Education Participants by developing programs that disseminate knowledge and influence practice across all industries within the health care sector. This active group of senior health care professionals from across the globe provides insight on the health care curriculum, offers opinions on research direction, supports student placement efforts, and assists in promoting the Health Care Initiative. 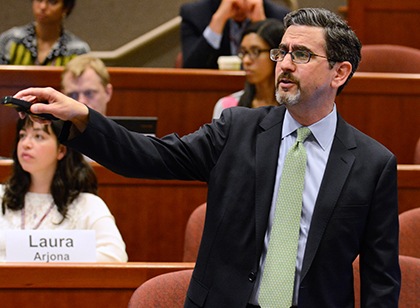 At HBS, students become tomorrow’s health care leaders. They study innovative health care organizations, put leadership into action through field-based activities, and participate in over 200 health care events across Harvard. With thousands of health care alumni around the world, HBS graduates are making a difference in health care. From Kathy Giusti to John Crowley to Peter Slavin - HBS alumni fund, start, and run health care organizations that create innovative change.